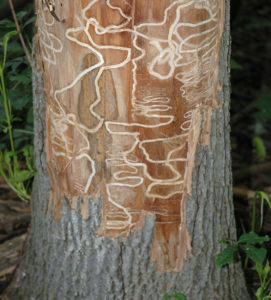 Emerald Ash Borer (EAB) is a non-native, wood-boring beetle that attacks ash tree species. It is an invasive pest that is rapidly killing millions of ash trees. Learn what we are doing on county managed lands and facilities. Learn what you can do with your ash trees on your private property. Learn more about EAB including background and FAQs. Just looking for the tree removal opt out form? Boulder County is removing designated ash trees from right-of-ways, open space properties, Housing Authority and other Boulder County facilities. The trees are most commonly removed between September 1 to April 31. Trees marked for removal are either infested with EAB, presumed to be infested with EAB, or are in poor condition. If you live adjacent to a tree along a right-of-way that has been marked for removal, you can apply for a permit to treat the tree yourself and prevent its removal. Permit holders are responsible for scheduling and paying for treatment in accordance with the terms and conditions. Not all trees are suitable for treatment. The management plan provides guidance to staff on the approved management options for county-managed ash trees in response to the emerald ash borer infestation. The management plan was approved by the Boulder County Board of Commissioners on August 25, 2015. Sign up to receive email updates about EAB in Boulder County and Colorado. The Watch Your Ash! Brochure and the EAB Decision Guide are great resources to help you decide what to do with your ash trees. Consider timing when scheduling your tree removal. Although Boulder County is contained within the EAB quarantine, the best time of year for tree removals is September 1 to April 31. During this time emerald ash borer, if present, is still under the bark of the tree. Beetles usually will not be emerging from the tree at this time and the risk for spreading EAB is low. DO NOT REMOVE ASH WOOD FROM BOULDER COUNTY! The state quarantine restricts the movement of all hardwood logs, limbs and branches. Check Wood disposal sites in Boulder County for where you can dispose of your woody material. Pesticide and insecticide treatments can protect your ash tree from EAB, but all chemicals have varied efficacies. 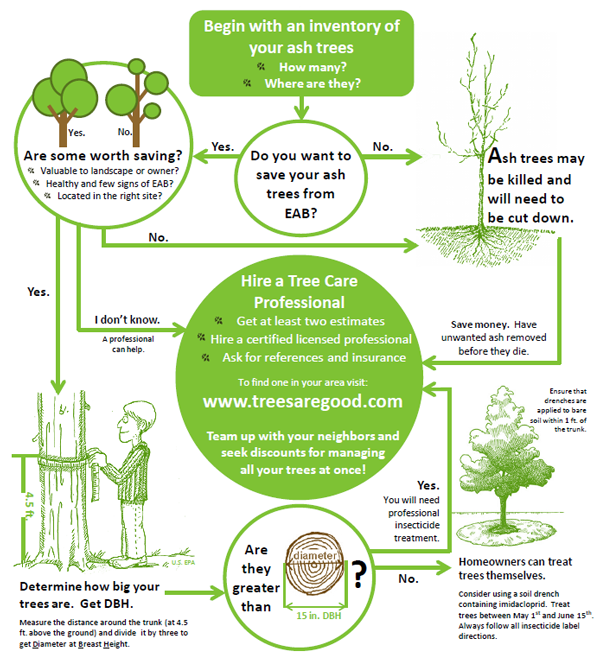 Hire an arborist to help you decide what to do with your ash trees. Arborists specialize in the care and maintenance of individual trees and are highly skilled in proper pruning, felling, stump grinding and tree planting practices. How much space do you have available for a tree? Can you plant a large shade tree, or is your space restricted by buildings or overhead utilities? Keep in mind that trees growing into power lines may be trimmed in the future by the utility company for clearance. What characteristics do you want the tree to have; large and provides shade, fragrant flowers, fruit or nut production? What are the moisture requirements for the tree? After considering tree characteristics and potential planting locations, you can browse the Front Range Tree Recommendation List . The compilation was developed by green industry professionals on the Front Range that have many years of experience working with the listed tree types. Trees rated ‘A’ or ‘B’ are best suited for the Front Range, while trees with ‘C’ rating may grow well when planted in an ideal location. Refrain from selecting trees with ‘D’ ratings as this group is highly susceptible to local pests and/or diseases. Unincorporated Boulder County residents may plant trees along county roadways, but must adhere to the Replanting of Trees in Boulder County Rights-of-Ways Policy. The Colorado Department of Agriculture has established an emergency quarantine in the Boulder County area related to the recent discovery of the Emerald Ash Borer (EAB). The quarantine is effective immediately. The quarantine prohibits the removal of all hardwood logs, limbs, firewood, and branches from Boulder County. Leave your firewood at home and “buy it where you burn it” since split logs and firewood can be difficult to identify without bark. Learn more about the state-issued quarantine. EABColorado.com is a site managed by the State of Colorado for information on identification, management and reporting of the EAB. Emerald Ash Borer is a collaborative inter-agency website from the USDA Forest Service, Michigan State, Purdue, and Ohio State that provides comprehensive information on the EAB in the United States and Canada. If you have further questions about EAB please contact the CSU Extension in Longmont at 303-678-6238 or eab@bouldercounty.org. Support for emerald ash borer educational materials and staffing provided by the USDA National Institute of Food and Agriculture, through the Western Integrated Pest Management Center. Emerald Ash Borer (EAB) was found in the City of Boulder on September 23, 2013, by City of Boulder Forestry Staff. 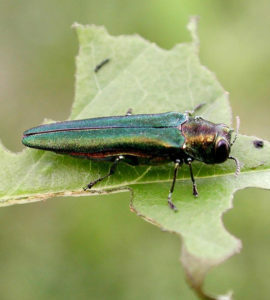 EAB is a non-native, wood-boring beetle that attacks native ash (Fraxinus) tree species. The Emerald Ash Borer is a state- and federally-regulated invasive pest that is responsible for the death of tens of millions of ash trees in 21 states. Unfortunately, this is the first time that EAB has been detected in the state of Colorado. Boulder County will be working with the city of Boulder, adjacent communities and the Colorado Department of Agriculture to ensure consistency and coordination of any communications and policy decisions. What is EAB and what does it do? EAB is a highly destructive, non-native insect that infests and kills all North American true ash species (Fraxinus spp.) including green, white, black and blue ash, and their cultivars (including autumn purple ash, a popular white ash varietal in Colorado). The larval stage of EAB feeds under the bark of trees, cutting off the flow of water and nutrients. Infested trees gradually die over a period of approximately two to four years. EAB adults are dark metallic green in color, with a coppery red or purple abdomen under the wings. The insect is approximately 1/2-inch long and 1/8-inch wide. Adults may be present from late May to September, but are most commonly active and visible in June and July, when they lay eggs on the bark of ash trees. EAB larvae are creamy white in color and are found under the bark, so are not as obvious, but their expanding S-shaped galleries (tunnels) can be located if the bark is removed. Larvae can be located using proper branch peeling techniques. Note that other metallic-green beetles and larval insect stages can be confused with EAB. Talk to a professional forester, arborist or other tree care professional if unsure about the possible presence of EAB in or on an ash trees. EAB is a strong flier, but adults typically fly less than ½-mile from their emergence tree. Most long-distance movement of EAB has been directly traced to human movement of ash firewood or ash nursery stock. Movement of other untreated ash wood, wood chips greater than one inch, and ash products (green lumber, pallets, etc.) also present a risk. What is being done in Colorado to mitigate the effects of EAB? The interagency Colorado Emerald Ash Borer Response Team, comprised of nine agencies/organizations*, is working with partner organizations and communities to help manage the spread and impacts of EAB. Starting in 2013, the EAB Response Team and partners worked to complete an initial survey to determine the extent of spread of EAB in Colorado, and the team continues working with local governments to determine and map the extent of infestation. As of March 2018, EAB has only been found in Boulder County, although it has been found in several cities outside City of Boulder. The team hosts EAB identification workshops targeting green industry professionals and volunteers and leads EAB education and outreach efforts to inform the media and public. Also, in the fall of 2014, the team released stingless, parasitic wasps that target and kill EAB in Boulder to help control the borer’s spread. Additionally, in 2014 the Colorado Department of Agriculture established a quarantine for Boulder County and surrounding areas to prohibit the movement of all untreated ash wood and all hardwood firewood out of the quarantined area. The quarantine includes logs and green lumber, nursery stock, wood chips and mulch. Quarantined items may be transported within the quarantined area, but may not be moved outside its borders, and any person violating this quarantine is subject to civil penalties up to $1,000 per violation. The full text of the quarantine, including additional restrictions, can be found at www.eabcolorado.com. *The Colorado EAB Response Team is comprised of members from the following agencies/organizations: Boulder County, City of Boulder, Colorado Department of Agriculture, Colorado State Forest Service, Colorado State University Extension, Colorado Tree Coalition, Green Industries of Colorado, University of Colorado and USDA Animal and Plant Health Inspection Service. Which trees are within the jurisdiction of the Boulder County EAB plan? The Boulder County EAB Management Plan does not apply to ash trees located on federal, state, municipal or private property within Boulder County. The Boulder County plan is only applicable to ash trees located within county-owned or maintained properties or rights-of-way managed by the following departments: Administrative Services; Housing and Human Services; Parks and Open Space; and Transportation. A Boulder County ash tree inventory identified about 1,500 such trees, most of which are located adjacent to county roadways. Why are some Boulder County-managed trees being removed before they are infested? Can’t we just let nature play its course? 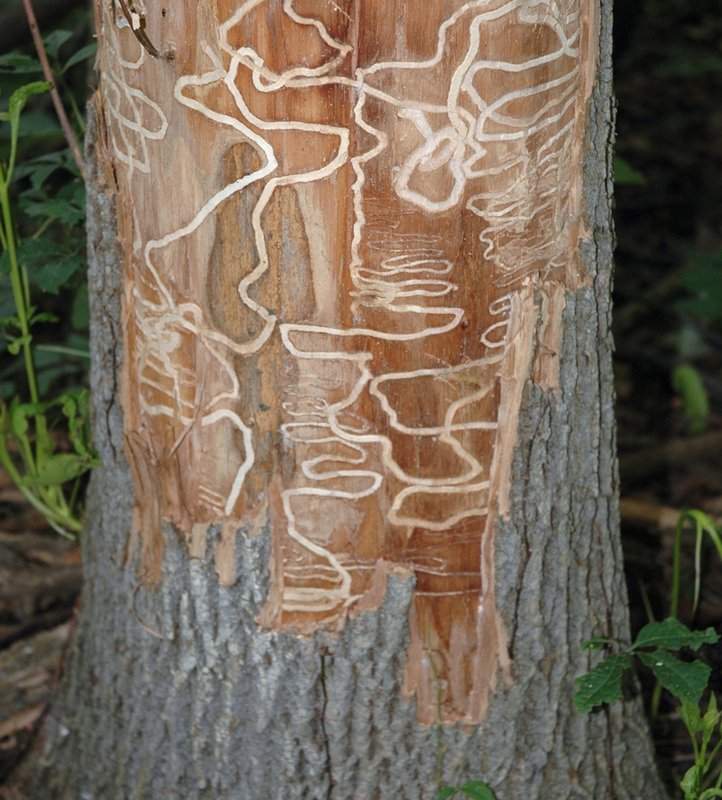 Unlike other pests or diseases, EAB infest trees quickly causing the wood to dry out and become brittle. Ash trees killed from EAB have been known to fall unexpectedly, warranting tree service contractors to refrain from climbing dead ash trees. Experiences from eastern states have shown that tree removal costs can typically be cheaper and safer when ash trees are still alive and structurally sound. Trees located along rights-of-ways or located in high-use public areas pose a high risk to the public and cannot stand dead. Boulder County will pre-emptively remove these ash trees. In open space areas where tree failure has little potential harm to people or property, Boulder County will allow trees to naturally decay and provide wildlife habitat. All ash managed by Boulder County are expected to become infested with EAB eventually, and it is likely that reactive removals would not be able to keep pace with tree deaths. To assure continued public safety around these trees, preemptive removals (and treatments) are a more responsible course of action. Additionally, removals during EAB’s dormancy period (typically September 1 – May 31) can help to slow the pest spread by removing larvae that would otherwise emerge in spring and infest new trees. This is true even for many trees in which EAB has not yet been confirmed, since EAB typically spends multiple years in a tree before its presence becomes apparent. 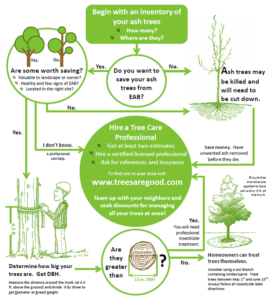 How has Boulder County selected trees for preservation from EAB? Boulder County has selected ash trees that are located at high-use public facilities as the only trees that are eligible for pesticide treatment. Public opinion and the views by the Board of County Commissioners’ weighed in on the decision to take a conservative approach to pesticide use. Regardless of the chemical, all pesticides have a potential for negative consequences, so trees that provide the greatest benefits to the greatest numbers of the public will be selected for treatment. All trees located at high-use county facilities were rated with a “matrix score”, that takes into account a tree’s health, form, size, proximity to structures, proximity to surface water (for pesticide considerations) and other factors, that rates and compares the trees. Points derived from each of these factors are added to equal a total matrix score for each tree, which is used as the primary resource to help Boulder County staff decide whether to treat or remove each tree. To learn more about the matrix score system, see section 5.3 of the Boulder County EAB Management Plan. 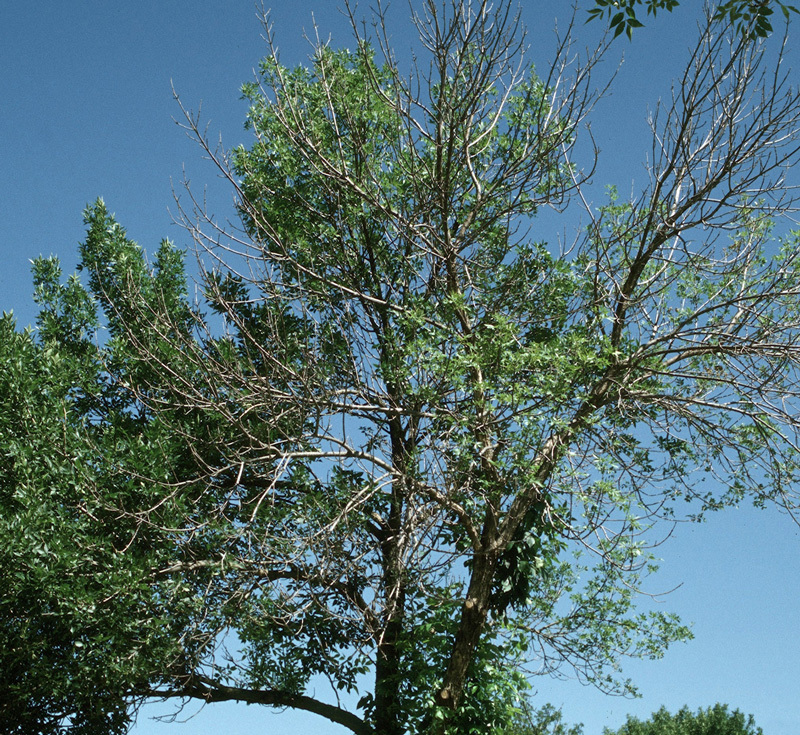 Why isn’t Boulder County preserving all ash trees with pesticide treatments? Aren’t pesticides cheaper than removals? The Emerald Ash Borer Management Plan for Boulder County Managed Ash Trees seeks to proactively manage ash trees by reducing the overall ash population throughout county owned and/or managed lands, protecting high-value ash trees, replanting high public-use areas, and maintaining public safety. Chemical treatments may be cheaper than removals in the short-term, but Boulder County is taking a conservative approach to pesticide use. Some pesticides are highly effective at preserving ash trees from EAB, but not all the effects of pesticide use are known. Not all ash trees are worth saving. 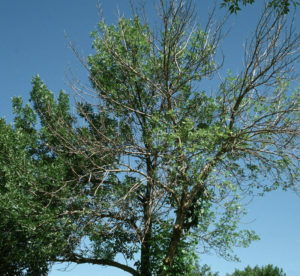 Ash trees generally struggle on the Front Range from the arid climate and have many native wood-boring pests that negatively affect the health of ash trees. Pesticide treatment is required every two to three years for as long as the tree is intended to remain in the landscape. Pesticide treatment on county-managed ash trees is only intended to preserve ash trees that are appropriately located at high-use public facilities that will provide benefits to many county residents. What pesticides has Boulder County approved for use on public ash trees and why? Boulder County has approved the use of Emamectin Benzoate and Azadirachtin. Both chemical formulations have proven effective at controlling EAB in all life stages of development for two years. Current product labels only permit applications via trunk injection, containing all chemical within the tree, eliminating drift from trunk or foliar sprays, and spread via soil drench or injection. Both chemicals may be more expensive than other chemical formulations, but have proven to be more effective at controlling EAB for at least two years. How will I know if an ash tree is infested with EAB? The presence of EAB in a tree typically goes undetected until more than a year or two after initial infestation and is difficult to detect. Many symptoms of an EAB infestation are typical of other common ash problems, so please consult a professional to help you make a determination.